Simple stir fries and curries are a part of our daily meal.They are not only quick to make but also makes a healthy side dish for rice and rotis.I am posting a spicy version of Beetroot stir fry which I absolutely love and the recipe is so versatile and can be adapted for many vegetables,do check the notes for more variations of this recipe.If you are bored of usual simple stir fries you should try this spicy version of stir fry which is really delicious.You can check out another version of simple Beetroot stir fry here. Wash,peel and cut the beetroot into tiny cubes or small pieces or cut into thin lengthy pieces. Heat oil in a thick bottomed kadai/pan and crackle mustard seeds. Add Chana dal and urad dal and fry until they turn in red color. Add broken red chillies and curry leaves and fry them until they turn crisp. Now add chopped beetroot pieces and fry or 2 mins. Remove the lid and increase the flame and cook until the moisture is evaporated. Add salt,vangibath powder and mix well and cook for another 2 mins on low flame. Now add roasted gram powder to it and give a nice stir and remove it from flame immediately. You can follow the same process for vegetables like Carrots, Broadbeans(chikkudukaya), French beans, Long beans, Cluster beans, Potatoes etc.You need to adjust the cooking time accordingly. If you do not have Vangibath powder,you can add normal chili powder along with roasted gram powder in the recipe. Beetroot pieces can be steamed ahead and add to the tempering and add the powders at the end. You can add 1 tbsp of dry coconut powder at the end,as my vangibath powder has that I did not add it extra.But even if you add extra it adds a nice taste to the curry. 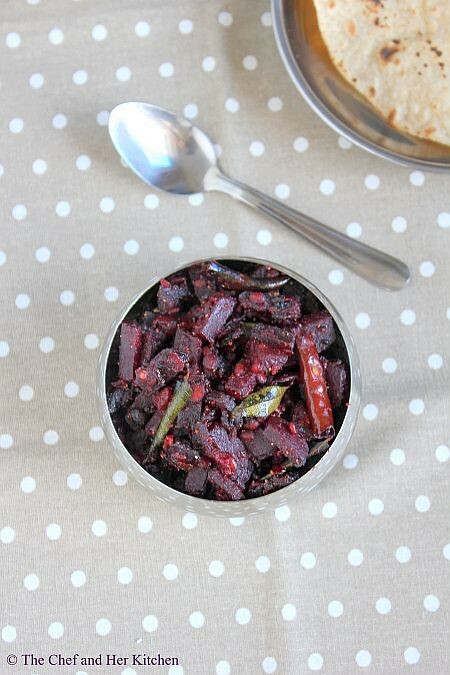 You can check out another version of Simple Beetroot stir fry recipe here. Delicious!! Can't wait to get some farm fresh beets this summer! 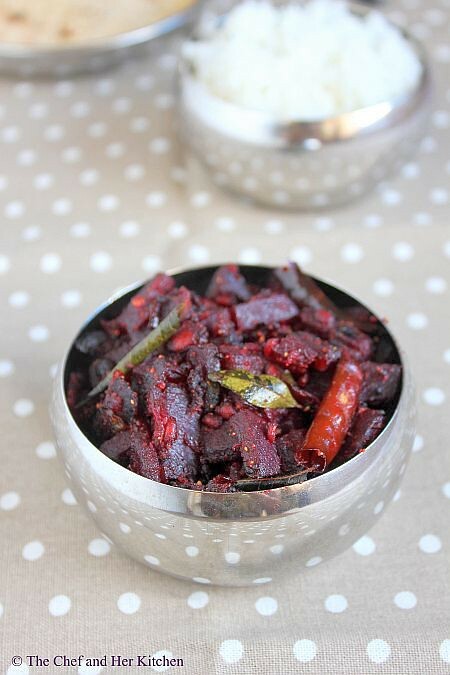 Beetroot fry with vangibath powder is great ...more than that pickle pictures stole my heart! 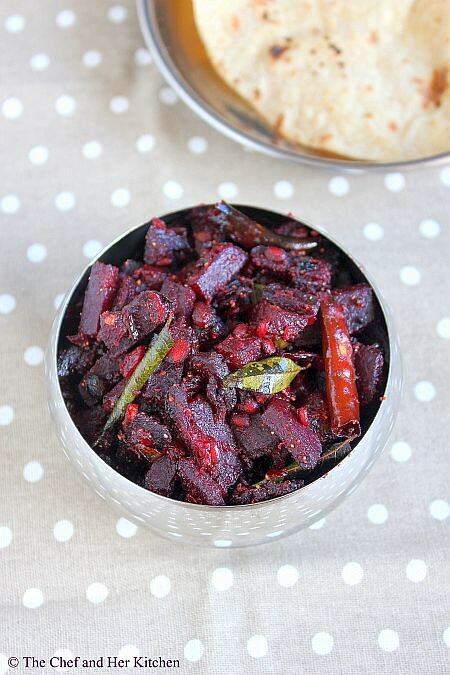 Nice presentation of the beetroot fry recipe . It is colorful and healthy too. vangi bhath powder hmm nice .It must taste really good. Yum, mouth watering recipe. My favorite curry dish. Thanks for sharing.